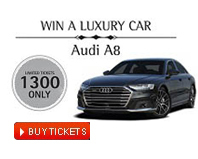 - Bahrain Duty Free gives you a chance to own your dream car. 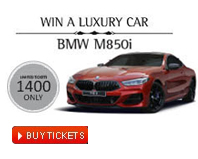 - All car raffle details are available on our website www.bdutyfree.com, where you can also increase your chances of winning by buying more raffle tickets. - Bahrain Duty Free reserves the right to use the winner name & photograph in all promotional, advertising & marketing campaigns. - Draw dates, results and winning number will be published online at our website www.bdutyfree.com and in the local & media. - The winner must hand over the original ticket as proof of purchase and a validated copy of his/her passport to claim the prize. - Bahrain Duty Free will ship the vehicle free of charge to the nearest sea port as per the address mentioned on the winning ticket. - The vehicle will be stored at Bahrain Duty Free’s warehouse for a limited period of one week after the draw. - Car conform to GCC (Gulf Co-operation Council Countries) specifications. - Employees of Bahrain Duty Free and their families are prohibited from entering the draw. - By participating in this raffle, you acknowledge and comply with all the terms & conditions above. - For more information, contact: Bahrain Duty Free Shop, P.O. Box 1714 Manama, Kingdom of Bahrain. 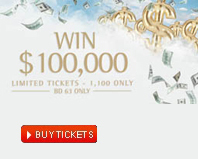 - Tickets for the cash promotion draw are limited to 1,100 only. - The USD 100,000 prize money will be transferred to the winner's account. - Any tax liabilities resulting from the importation of the prize money are the sole responsibility of the winner. - Draw dates, results and winning number will be published online at our website www.bdutyfree.com & social media accounts. - The winner must hand over the original ticket as proof of purchase and a valid copy of passport to claim the prize. - All details on this raffle are available on our website:www.bdutyfree.com, where you can also increase your chances of winning by buying more raffle tickets. - Tickets for the cash promotion draw are limited to 250 only. - The USD 10,000 prize money will be transferred to the winner's account. - All details on this raffle are available on our website: www.bdutyfree.com, where you can also increase your chances of winning by buying more raffle tickets.